Electric car startup Byton made a big splash at this year’s CES Conference, introducing an SUV concept with a whopper of a center dash screen. Now, it has a half-billion dollars more in funding to get off the ground, along with a new concept, a fully-autonomous, all-electric sedan called the K-Byte. It looks sharp. Byton’s $500 million of funding this week came by way of a series of new investors, and the Chinese-based startup announced a new HQ in Nanjing, China. The startup also has a research and development center in California. If the company’s ambitious production plan goes according to plan (and having things going to plan is a big honking wish in the world of startups), Byton thinks its first vehicle can launch at $45,000, even including the massive 49 inch screen splashed across the center dash. The K-Byte is an interesting idea, though, if only for the timing of it. The auto industry’s consumed by an incredible appetite for SUVs and crossovers. It’s almost as if Byton’s trying to stick out its feelers and gauge how people react to the sedan, and keep it in their back pocket in case the tides change over the next few years. That could be to its benefit, because the K-Byte is a looker, save for the weird, future-y face. Byton offered few specifics about the car, but pegged it as a ride of the future. (They seemingly all are today.) In particular, the company says it wants the K-Byte to be a level 4 autonomous car, meaning it can handle all driving tasks in some but not all environments. The startup said it has teamed up with Aurora, an autonomous driving tech firm helmed by Chris Urmson, Google’s ex-car chief, and Sterling Anderson, the former lead of Tesla’s Autopilot program. Aurora already has some big names amid its list of partners, including Volkswagen and Hyundai. 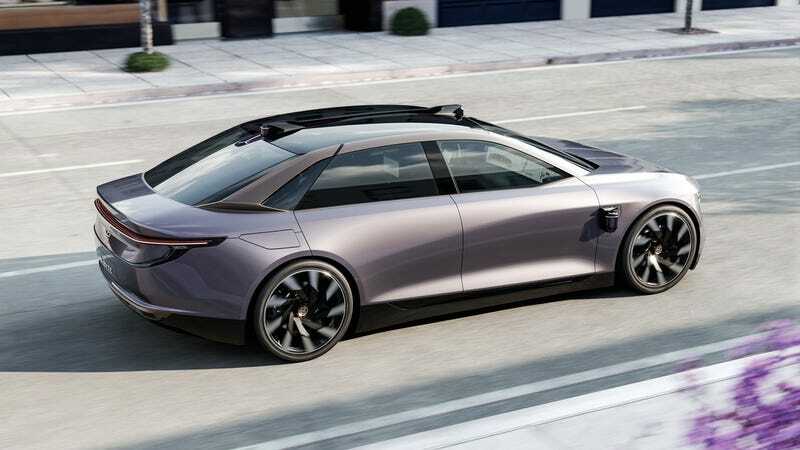 With Byton, the startup said, it plans to develop a fleet of prototype vehicles with level 4 capabilities by the end of 2020. It goes without saying that planning the launch of a commercially available, autonomous vehicle is about as ambitious as it goes right now. Byton thinks it can make it happen by 2021 with the K-Byte. I’ll hold my breath for now. The K-Byte’s going to share the same platform at the SUV concept, according to the startup, whose CEO told The Verge about 65-70 percent of the parts between the two will be the same. That, the Verge notes, includes the center screen that covers the entire front of the car. The tablet in the steering wheel is what really gets me. Ambitious, aggressive timelines haven’t stopped car startups from issuing ambitious, aggressive goals before. The same goes for Byton. The startup thinks it can begin making the K-Byte sedan in 2021.